We needed to linger in the Budapest environs between Adrian’s dental appointments. We’d spent several days in the city, so it seemed time to head up river. 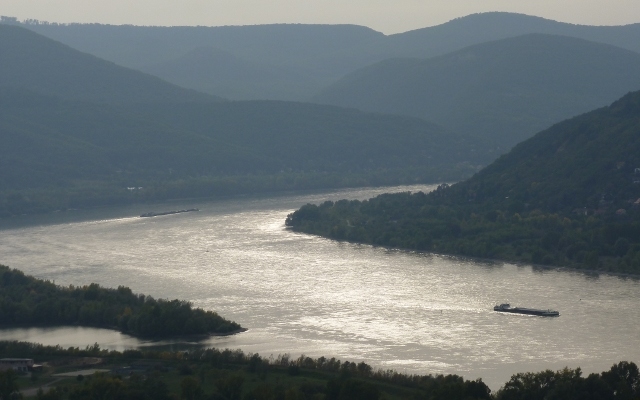 The Danube Bend is, as the name suggests, a dramatic bend in the river as it wends from flowing eastwards to southwards forming part of the border with Slovakia. 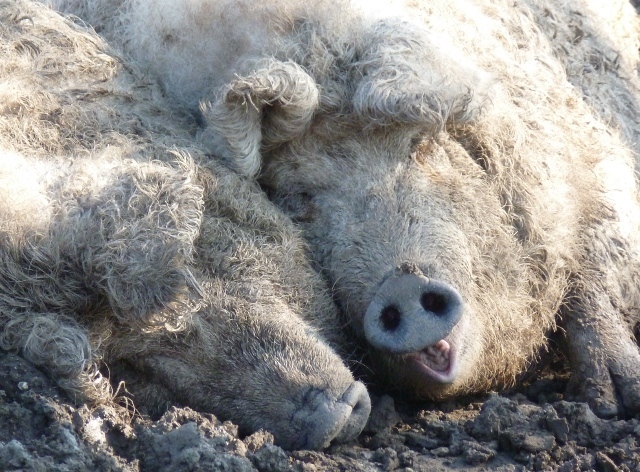 We’d heard that it was a scenic area with lots to see and do. So we set off to see and do it. 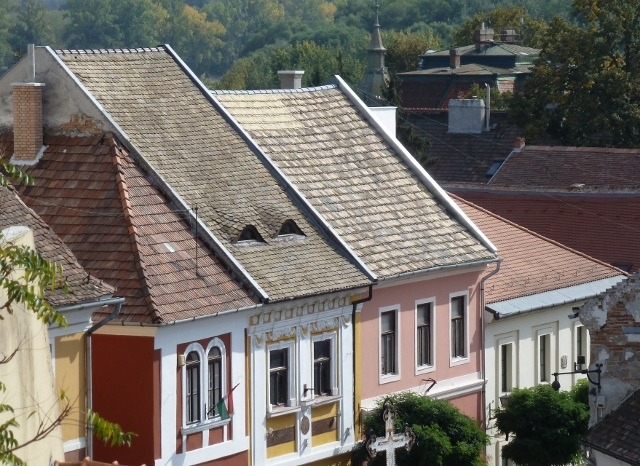 Our first call was the town of Szentendre about 40km north of Budapest. It was a centre of Serbian immigration during various periods of history when Serbia was being overrun by Turks. Pastel-coloured buildings line the streets and face the river, with several picturesque churches perched here and there. Since the 1920s though it has become home to many artists and has a lively café life, lots of craft shops along its narrow cobbled streets. It was Monday though, and most of the churches and most of the galleries were closed. We headed on along the river, finding a nice looking campsite open when we thought it would be closed just outside the town. 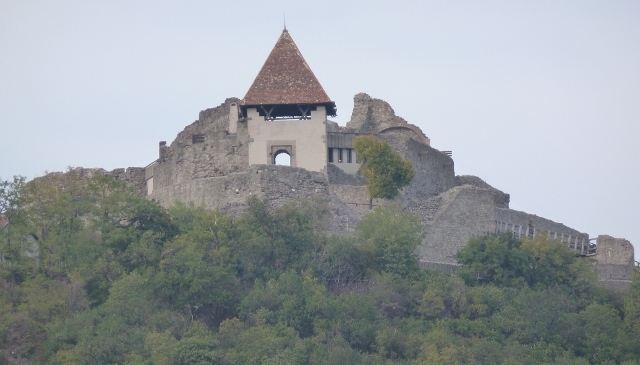 It was too early to stop and we continued to Visegrád, a small town sitting right on the curve of the bend, with a citadel high above it, and fortifications below reaching down to close to the river. Visegrád means ‘high castle’ and it dates from the 13th century when it was built to withstand Mongol invasions. We found the lane up to it, thankfully we didn’t have to walk all the way. It afforded fabulous views of the bend in the autumn afternoon sunlight, and had a few rooms with exhibits in, amongst the ruins. It was the once the royal residence, and housed the crown jewels until they were apparently stolen by a maid in the 16th century, and our old pal Vlad the Impaler was once imprisoned here for several years in the 15th century. There is also a Royal Palace far below in the middle of the town. We pressed on to Esztergom. It was getting to be time for a campsite and we hoped there might be one open just south of the town. We saw a couple of motorhomes driving around looking rather lost, but eventually found the way to the site, but it was closed. A shame because it was a stone’s throw from the centre of the dramatic looking town. We have been using a rather ancient Rough Guide to Hungary – the information is around 15 years old, but as it has the main things we have hung on to it. It mentioned the ruins of a bridge nearby but we hadn’t spotted this. 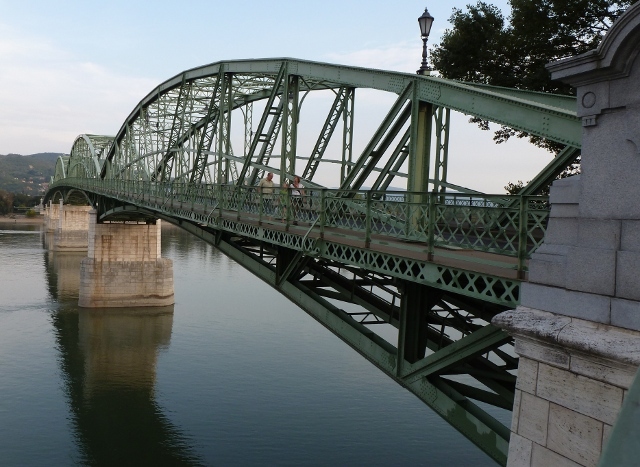 As we took the road we thought was leading us back into town, we found ourselves on a bridge across the Danube, and totally unintentionally arrived in Slovakia. Not quite where we wanted to be, not yet anyway, but we still felt a bit rude just entering the country and doing a U-turn. We weren’t the only ones though – at least one other disappointed campervan had found themselves in Slovakia by mistake. Fortunately both are Schengen countries so there was no border control. Being the other side of the river though also meant a terrific view of the city. 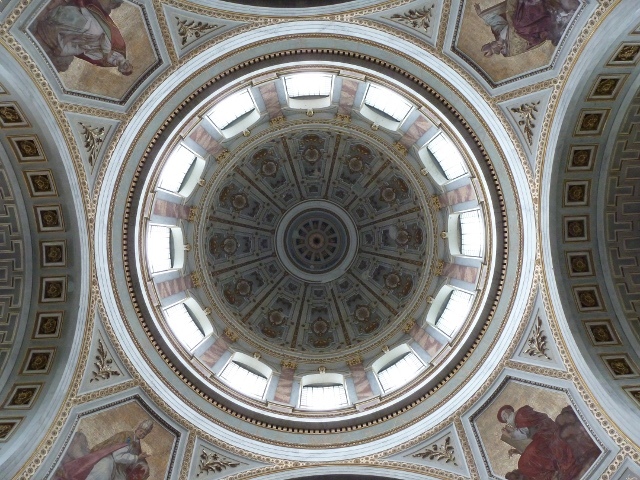 Its cathedral and castle walls create a dramatic imposing skyline for this centre of Catholicism in Hungary. More reading up found that the ruin of the bridge mentioned in our guidebook had been rebuilt. Destroyed in the Second World War, and never rebuilt due to ambivalence between the two countries during the Communist era, harmony has obviously been restored and the new Mária Valéria bridge was opened in 2001. It was built with a grant from the EU, to help applicant countries with their joining preparations. We pootled back to Visegrád again where we thought we’d spotted a campsite open. It would have been nice to camp wild by the river and there were good spots to be had, but there were stern no camping notices. The campsite was open, but deserted. We were the only people there in fact, but it was lush and green and we parked amongst the trees. In the early hours we awoke to one of the most dramatic thunderstorms we’ve experienced, wildly flashing lightening and rolling of thunder fit to wake the dead and shake the van where it stood. Torrential rain followed, the remains of which lasted all the following day. 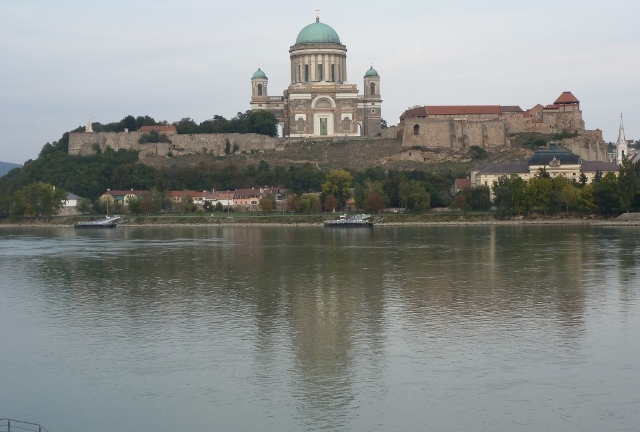 Downhearted by the change of weather, and the low cloud that obscured the hills, we drove back to visit Esztergom properly, relieved that we had seen its best view in the sunlight the previous evening. We parked near the huge basilica and traipsed in the rain towards the ticket office. It was on this site that King Stephen (or Istvan in Hungarian), later Saint Stephen, was crowned in 1000 AD and where Hungary was brought into Roman Catholicism. Subsequently the area fell under Ottoman rule and it wasn’t until the 18th and 19th centuries that the town recovered and the cathedral was rebuilt. It is as huge and impressive as you would expect such an important place to be. There is also an important shrine in the crypt to a more recent figure, Cardinal Jósef Mindzenty, who bravely opposed Communist rule. He was arrested in 1948 and tortured for 39 days before being sentenced to life imprisonment for treason. Released during the 1956 uprising he sought refuge at the US Embassy where he lived for the next 15 years. Eventually exiled to Austria where he died, he was reburied at Esztergom in 1991, the year that also saw a visit from Pope John Paul II. We also paid to see the Treasury which we’d heard was something special. We spent ages there marvelling at the fabulous treasures, from clerical garments with three dimensional embroidered scenes on them, to the gold goblets from all periods of decorative arts history from medieval to art deco. After lunch, still raining, and lacking the enthusiam for more museums after such a visual overload, we drove back towards Szentendre and the campsite we’d spotted there the day before. To cheer ourselves up, we stopped in the town to buy some cakes, rather apalled by the fact that council contractors appeared to be hacking down all the trees along the river front. They’d not pollarded them neatly, yet seemed to be leaving the trunks there. Too rainy to find out more about what was going on, we headed for the campsite for an evening cooped up in the van. A bright morning greeted us and lifted our spirits as we set off to see Szentendre’s must-see Village Museum or Skanzen, the latter name often used for open air museums in Hungary, Slovakia and Poland, named after Stockholm’s famous Skansen open-air museum of vernacular architecture and way of life. After waiting for umpteen school groups to enter, we were in and it was a big enough site to disperse all the groups nicely. 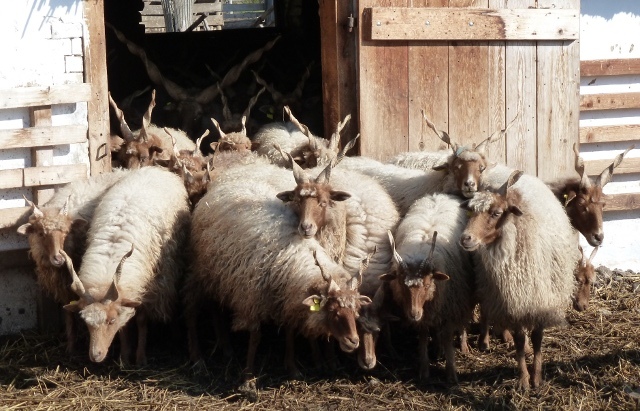 The school groups all had activities laid on, such as trying their hand at butter churning and jumping up and down in a hayloft. We had most of the old houses and cottages to ourselves as we spent several hours wandering around village settings from different parts of the country. 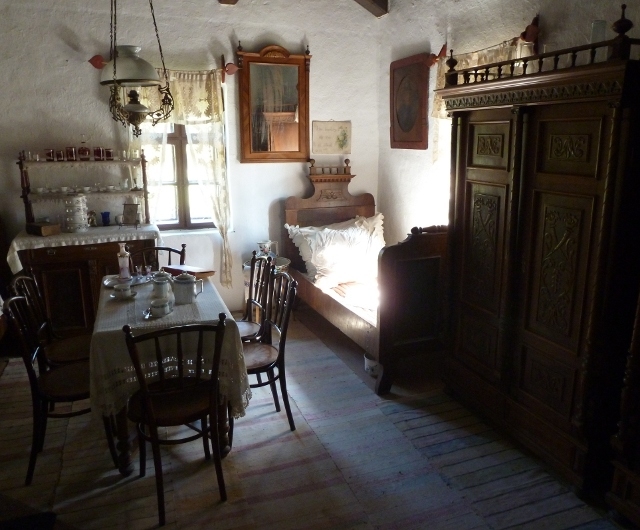 Beautifully set up and furnished, it was a lovely place. 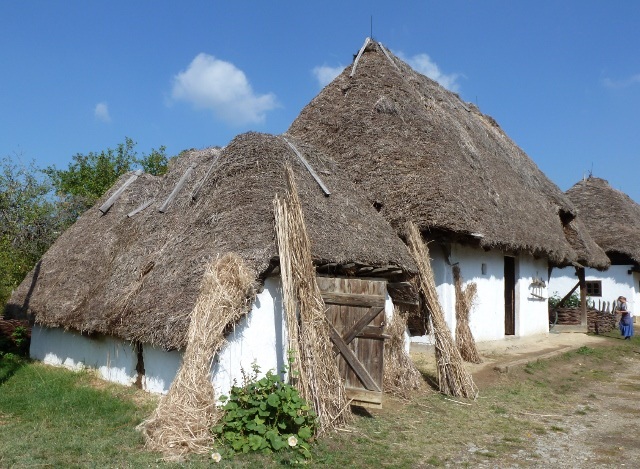 Sadly, we don’t have time on this trip to really explore rural Hungary to the full, so this gave us an insight into what villages in different areas and from different points in time might be like. 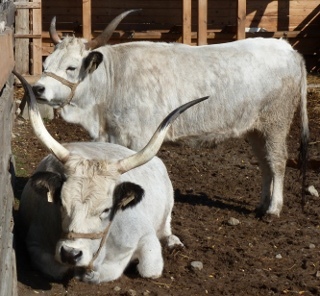 The farm in the centre of the museum had Hungarian breeds such as the longhorned grey steppe cattle, a flock of whimsical twizzle-horned Racka sheep who we managed to coax out of their barn, and three curly haired Mangalica pigs languishing in their muddy pen who weren’t taking any notice of anybody. Just a small fly in the ointment, we were charged for parking, which took us aback a bit as the entrance fee wasn’t cheap and it was way out of town, but then they couldn’t seem to get their act together enough to take the money for it so we could leave without hanging around for an extra few minutes. We had stayed a little longer than planned in the museum and had a pressing engagement with Adrian’s dentist back in the city so had to dash. In spite of the mixed weather, we really enjoyed this interlude up around the scenic Danube Bend. This entry was posted in Art & Culture stuff, By Country - Hungary, Travel stuff. Bookmark the permalink.